Turn on the news, open your Facebook, check email...does it ever feel like you're in the midst of a fire storm? Politicians attempting to stir our emotions, reporters persuading our hearts, even meteorologists can dramatize an everyday weather occurrence to the point of certain Armageddon. While some of these daily inputs are overdone, others are truth and should be taken seriously. Undercover videos revealing a horrible and sordid illegal business thriving from the murder of unborn babies in mothers' wombs. Public beheadings that sneer in the face of all that is just and good. The godly institution of marriage being stripped by a few judges who devise a vain thing. These are real storms. These are real battles. What? Storms? Battles? Maybe this seems hard to believe. We have been living in magnificent comfort here in these United States for years and years. My generation has only seen a few acts of terrorism on our soil, and for most of us it wasn't exactly in our 'back yard'. Certainly we are falling on some hard times now, but those battles are distant and will only fade away. Right? 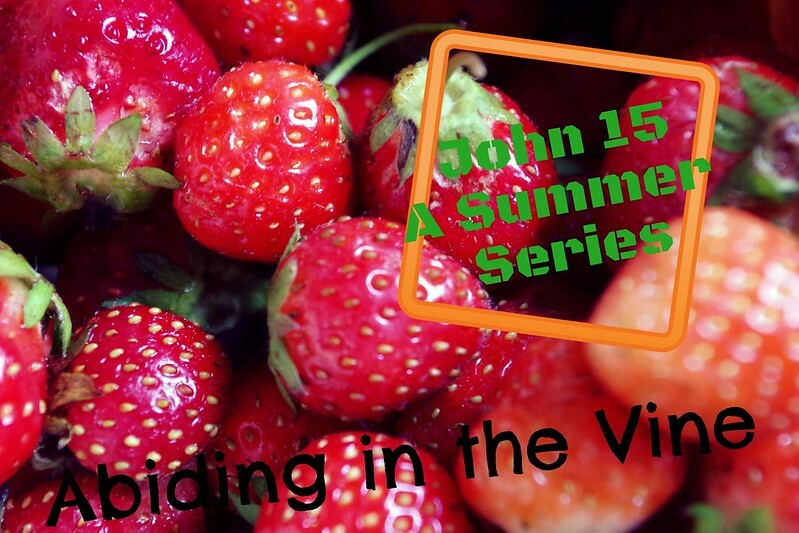 As this post series has focused upon abiding in the Vine, Jesus Christ, from John 15, I pray that you might open your Bibles to John 15 and read this chapter (or more) yourself. This passage has always fascinated me as I have imagined Jesus walking along the vineyards with His disciples sharing important details with them just before His impending death. He was preparing them for the coming storm, the battle where He would willingly give up His life to save the lost from the wrath of God. The battle where He would defeat death. The battle where He would crush the serpent's head. After Jesus compared Himself to the vines and spoke of fruitfulness and glorifying God, the Father, He continued on and spoke of the greatest love (vs. 13) and then the greatest hatred (vs. 18). Among Jesus' final words was the exhortation to His followers that the world would hate them. Jesus prepared them with these truths about the world's hatred of Him and His followers, but He did not leave them without a Helper. Abide in God's Word and you will know His truth, the absolute truth that is unchanging and universal. As the storms rage, we will have words of truth that will set the captives free (John 8:32). Because of the Holy Spirit whom Jesus has given us, we will have boldness to speak the truth and testify of Jesus Christ. Knowing the power of God Almighty, we can give those who are imprisoned in their sin the hope of redemption and transformation (see 1 Corinthians 6: 11). The other day I was point-blank asked by my son to describe abortion. His father had recently shared with us a sad story about a young girl who was murdered in broad daylight while standing next to her father. I likened abortion to this. A mother stands on while a murderer violently takes her defenseless child's life. There are some differences in these stories, of course, but speaking the truth about this "medical procedure" shed light on abortion. Are you willing to speak the truth in the battle around us? Are you willing to fight for the defenseless? Are you willing to call what is sin, sin? If God is for us, who can be against us?...Who shall separate us from the love of Christ? Shall tribulation, or distress, or persecution, or famine, or nakedness, or peril, or sword?...Yet in all these things we are more than conquerors through Him who loved us. For I am persuaded that neither death nor life, nor angels nor principalities nor powers, nor things present nor things to come, nor height nor depth, nor any other created thing, shall be able to separate us from the love of God which is in Christ Jesus our Lord. Wow! Who can't fight for the glory of her Father when she knows that kind of victory and that kind of love?!? Amen!